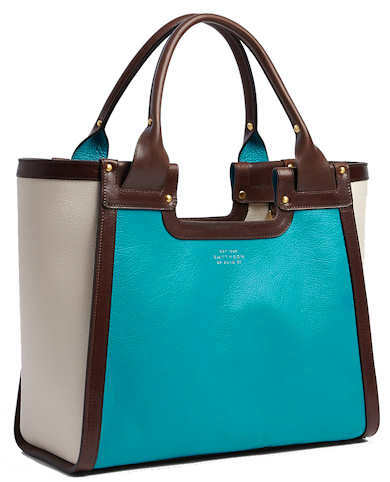 The Smythson Cooper Tote Bag is a spacious tote bag made from soft and supple goat skin, in turquoise, brown and cream leather, with gold tone fittings. The contrasting colours create an eye catching colour block effect and the gold plated rivets add a touch of refinement. At the top of the bag, there is a double press stud fastening tab closure. Inside, the bag is incredibly roomy. It is lined in a natural jute fabric and has two ruched pockets together with a deep, leather trimmed slip pocket to the side. There is gold embossing on the front of the bag with designer logo. Measurements: 38.5cm / 15.1″ x 16cm / 6.3″ x 32cm / 12.5″(all measurements are approximate). Style note: This is a statement tote and ideal for adding a splash of colour to more sober outfits. It is a spacious and well organised bag – it’s wider than the average bag which creates lots of extra space. This Vivienne Westwood Chancery Bag 5010 has an all over embossed “moc croc” crocodile design for the new season. 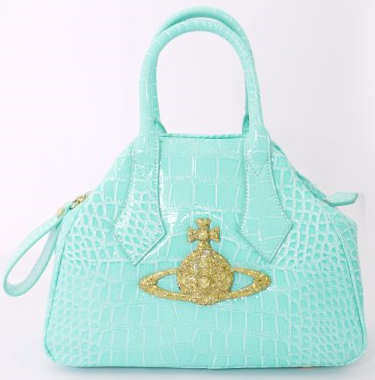 This bag is a smaller Yasmin style bag with a zip top fastening and is made from faux patent leather (polyurethane), featuring a large gold glitter orb on the front. All the metal hardware on the bag is gold in colour, and the stud on the zip pull features orb embossing. Inside, the bag is lined in black and beige striped cotton canvas and there is a zip fastening pocket and golden brand plaque. Style note: Vivienne Westwood’s Chancery bags are fun and girly bags that are great way to add a dash of fun to your daywear or evening ensemble, and the gold plastic glitter orb and oversized zip pull add a touch of charming kitsch to any outfit from skinny jeans to your little black dress. 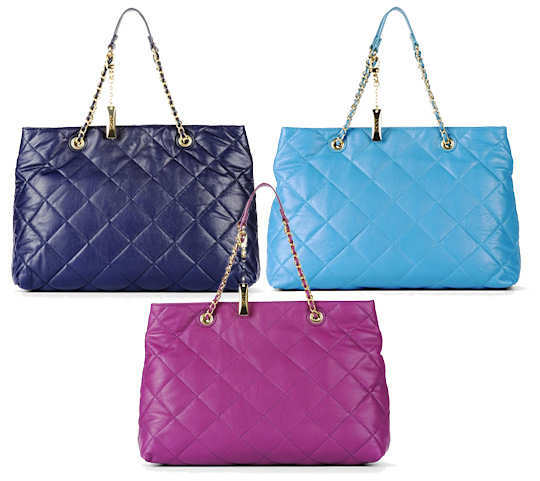 The DKNY Quilted Shopper is guaranteed to brighten up your daywear wardrobe with its instant colour and charming good looks. It also has a lush gold double chain strap and a magnetic stud fastening. This bag comes complete with the DKNY handbag charm which attaches to the shoulder strap. Inside, the bag has a zip pocket and a mobile phone pouch. 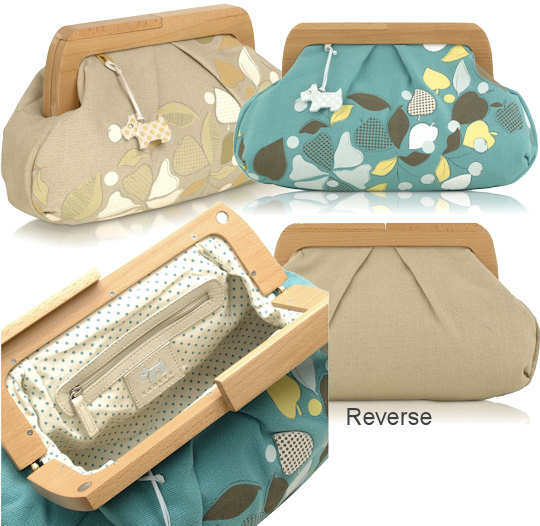 The Radley Woodstock Large Frame Clutch has a secure magnetic fastening and is available in natural or turquoise. It is a lightweight bag made from linen with a smart wooden frame. Included with the bag is a polka dot leather Radley dog handbag charm. The bag is trimmed with leather appliqué leaves that are sewn onto the bag. Inside, the bag is lined in a polka dot print material and there are four pockets, two open and two zipped. Measurements: 32cm (width) x 23cm (height) x 16cm (depth); (all measurements are approximate). Style note: The Radley Woodstock clutch is very spacious for a clutch bag, meaning that it makes the transition from daytime use to evening use absolutely seamless. The Radley Whittlesey is a frame handbags in the style of a small grab bag. It is made from the softest leather imagineable and has a single top handle with central leather weave detail and a clasp fastening at the top. Other features include contrast stitching down each side of the bag and the Radley dog who hangs down the front of the bag on a woven leash. Inside, the bag is lined in a polka dot material and there are two zipped pockets. Measurements: 26cm (width) x 16cm (height) x 8cm (depth); the length of the shoulder /hand strap from the top of the bag to the apex is 14cm (all measurements are approximate). Style note: This handbag is bag is absolutely adorable and would be great to use for summer events and occasions, being big enough to hold all your basic essentials whilst remaining incredibly stylish. 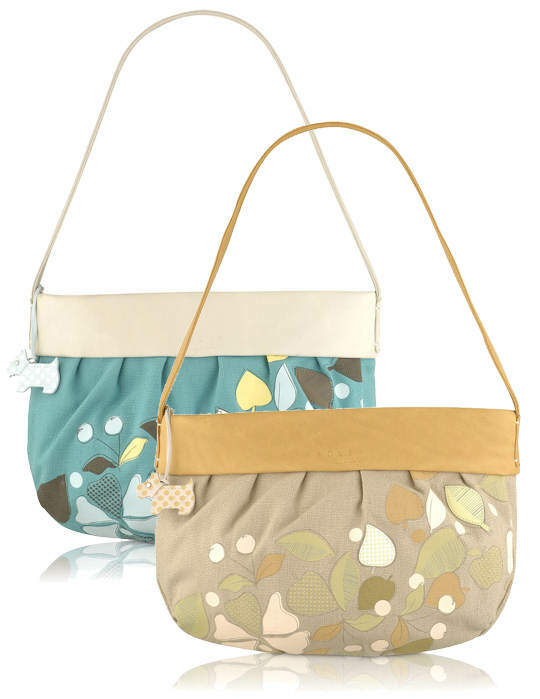 The Radley Woodstock medium sized shoulder bag has a zip top fastening and is available in tan or turquoise. It is a lightweight bag made from linen and trimmed in leather, including leather appliqué leaves that are stitched onto the bag, the strap and the soft collar around the top of the bag. There is a polka dot leather Radley dog hanging down from the top of the bag. Inside, the bag is lined in a spotty material and there are four pockets, two open and two zipped. Measurements: 36cm (width) x 17cm (height) x 13cm (depth); the length of the shoulder strap is 26.5cm; (all measurements are approximate). Style note: The Radley Woodstock is an extremely attractive and lightweight bag, making it a great daily use handbag for the summer months. 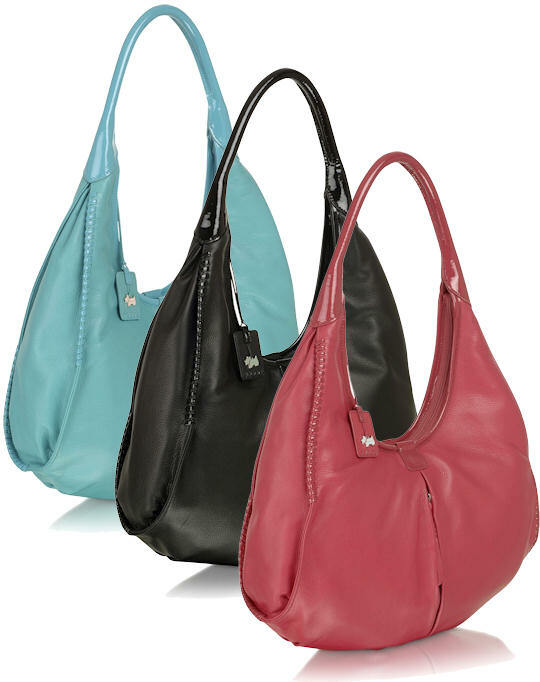 The Radley Sudbury large hobo shoulder bag, available in turquoise, black, or pink, is made from soft leather and trimmed in patent leather stitching. It is a generously sized hobo bag with a scoop shape. 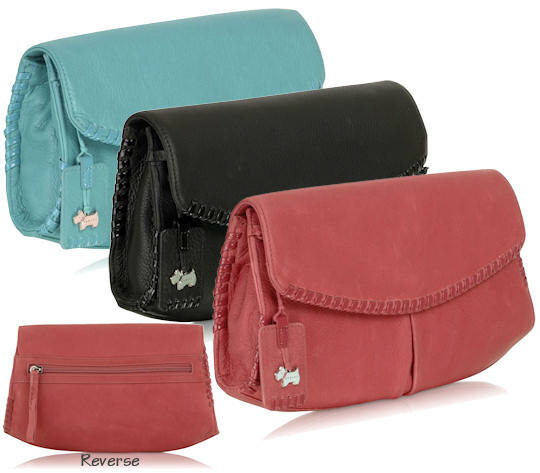 This bag has a zip top fastening and there is also a zipped pocket on the reverse of the bag. 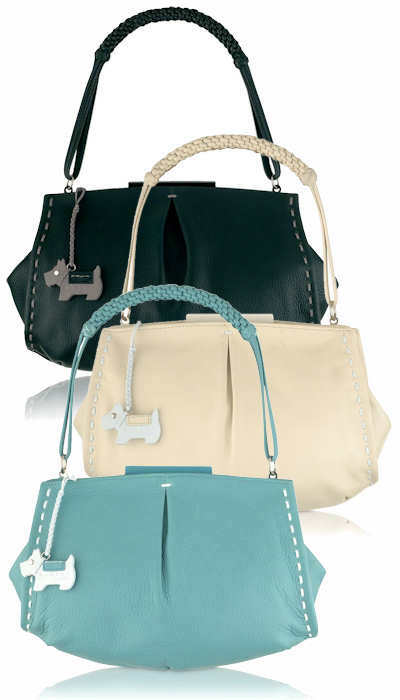 A contrast coloured Radley dog hangs from the top of the bag, mounted on a leather tag. Inside the Sudbury, there are two slot and two zip pockets. Measurements: 32cm (width) x 19cm (height) x 10cm (depth); the length of the shoulder straps from the top of the bag to the apex is 30cm (all measurements are approximate). Style note: This lovely super butter soft leather bag is bound to be in demand for summer and beyond, and now you can also get matching Radley Sudbury shoes! 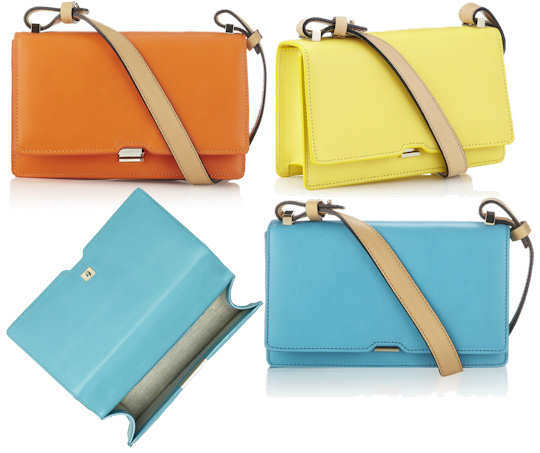 The Radley Sudbury Medium clutch bag in three bright colours is hand crafted from very soft leather, and trimmed in patent leather stitch detail. A flapover style, the Sudbury has a stud fastening. 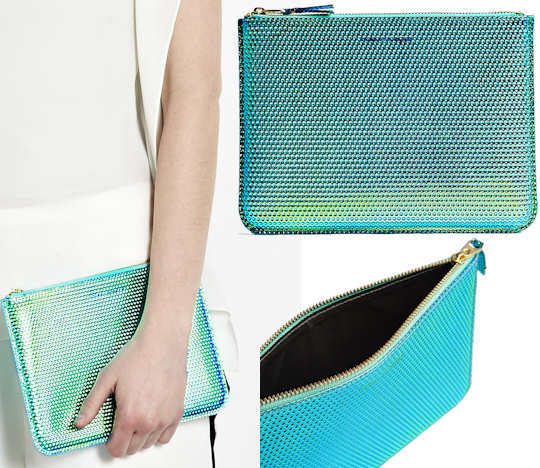 Inside the clutch, there are two zip pockets, and there is a further zip pocket on the reverse of the bag. Measurements: 24cm (width) x 20cm (height) x 19cm (depth); (all measurements are approximate). Style note: This is a great little clutch for parties and events during the day or the evening, and now you can also get matching Radley Sudbury shoes!